An extensive range of Promotional Confectionery including Chocolates, Mints, Jelly Beans and including teabag and coffee sachets. 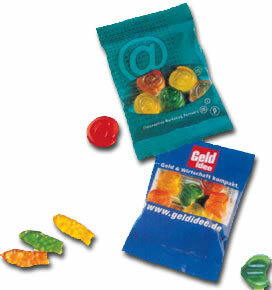 A selection of yummy, gummy jellies, available in a choice of shapes and a clear or white wrapper thats fully customisable. Minimum Order: 5,000 Delivery: 4 weeks.